It might not be as fun as a romp in the dog park – for you or your pet – but cleaning her ears helps keep them healthy and free of inflammation and infections. As Dr. Lorie Huston, DVM, explains in the Pet Health Care Gazette, the frequency of needed cleaning varies individually. Check your pooch’s ears weekly for cleanliness and signs of infection; some breeds benefit from a weekly cleaning. The “L” shape of canine ear canals makes them vulnerable to accumulation of wax and debris and to infections. Dogs with heavy, floppy ears are at higher risk, according to an overview from the University of Washington College of Veterinary Medicine. A little routine maintenance goes a long way toward keeping your pup’s ears in tip-top shape. Sit or lay your dog on an easy-to-clean surface or towel where you can reach her ears. Pull your dog’s ear flap up gently and check for visible signs of infection, which may include redness, swelling, discharge, crusting, scabbing, foul odor or localized hair loss, according to WebMD. If there’s cause for concern, skip the cleaning and make an appointment with your veterinarian; otherwise, proceed. 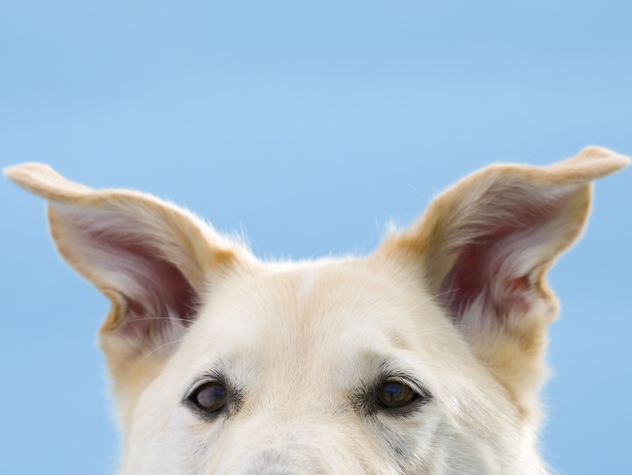 Fill one of your dog’s ear canals with canine ear cleansing solution. Only insert the bottle’s applicator tip a few millimeters into the ear canal. Apply a few drops to the inside of the ear flap, too. Massage the base of your dog’s ear gently for about 30 seconds to loosen wax and debris. Hold your dog’s ear up and tilt her head slightly so the solution runs out. Use clean cotton balls to wipe away wax, dirt and debris. You should only see a small amount of yellowish or light brown discoloration on the cotton balls. Clean the other ear the same way. If there seems to be an excess of wax or dirt, clean the ears again the next day. Cleaning your pooch’s ears regularly helps keep the process fast and easy, and she’ll become more cooperative over time. Consistent care also reduces the risk of ear infections, inflammation and other problems. Get tips and tricks to keep your dog's ears squeaky clean.